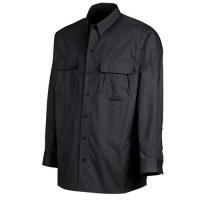 Dickies Tactical Long Sleeve Vented Ripstop Shirt is a quality work garment made for those in public safety. The flex fabric provides comfort with no restriction in movement. Made of cotton-polyester blend material, this shirt gives you a professional look while providing features you need to get you through your day to day duties. This Tactical Ripstop gives you breathability with its vented side mesh panels. Pockets include a hidden compartment with a zipper closure for securing important documents, chest storage pockets, sleeve pocket for pencils, loop for sunglasses, and a separate bag for camera tab and badge holder. Additional features of the Vented Ripstop are a doghouse placket with adjustable cuff closure and a hidden button down collar.